This 150 page handbook provides sponsors, facilitators, and participants the essentials for a successful group (AKA peer or team) coaching program. 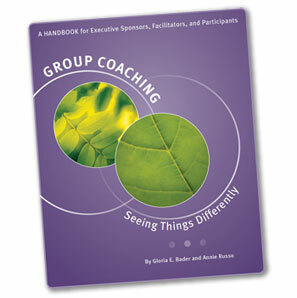 It is designed to serve as the year-long workbook and private journal for participants and facilitators. The 8 1/2 X 11 inch, spiral-bound Handbook offers many colorfully illustrated metaphors and diagrams, places for note taking, inspirational quotations, worksheets, sample journal questions, sample coaching questions, and goal setting prompts. Self-published by The Bader Group. We will print and ship Group Coaching on demand for $100 per Handbook plus shipping and handling ($24.00 for one book or $30.00 for 2 or more books). 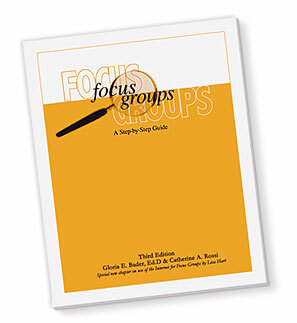 Using focus groups is a powerful data-collection tool that can sharpen the information gathered by human resources, production, or service departments. Focus groups tap invaluable data on a wide variety of topics from organizational stakeholders — including employees, clients, suppliers, and leadership. This book provides a practical guide for planning, conducting, and evaluating data engendered by focus groups. How do professionals effectively gather and distill data critical to decisions and successful change? 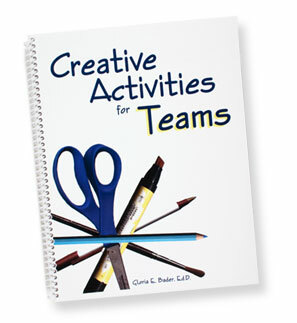 Creative Activities for Teams is a collection of original team building activities for teams and groups who want to strengthen their trust and communication. This 60-page book, written and designed by Gloria E. Bader, is a collection of original activities that teams and groups who want to strengthen their trust and communication can do together. Simple directions, examples, variations, and artwork are included. The activities are fun yet challenging and thought provoking. Most require the adventurous use of one’s right brain. Reproducible handouts are provided. Teamwork increases motivation, commitment, communication, and generates new energy to sustain teams through change and difficult times. Organizations that have made the transition from traditional work groups to team have discovered many benefits along the way — better decisions, greater commitment, and improved quality, to name a few. One of the challenges, however, has been realigning performance measurement systems to match the new team structures. This guidebook answers that challenge by presenting valuable tools to gauge team effectiveness on two critical fronts: the team’s work outcomes, and the operating dynamics of the team itself. 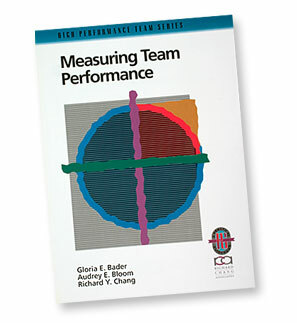 Measuring Team Performance provides practical methods for teams to evaluate their performance, dynamics, and effectiveness. 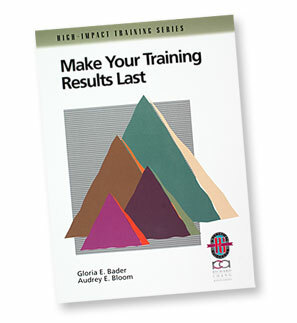 This 105-page paperback by Gloria E. Bader and Audrey E. Bloom is a practical guide to successful training follow-through. It can provide your organization with the tools, exercises, and techniques to stretch training dollars and guarantee the effectiveness of your training program. Published by Richard Chang Associates, Inc., Irvine, CA. (High-Impact Training Series). Provide your organization with the tools, exercises, and techniques to stretch training dollars and guarantee the effectiveness of your training program. Copyright © 2019 The Bader Group. All Rights Reserved.